OWS Declaration of Occupation: “There is no hierarchy.” The declaration was crafted at a general assembly of all those who wished to participate. It is being recited here by means of the “human microphone,” passed through repetition from the front of the crowd to the back. When the Korean war began, I wrote in my diary that just as the first half of the 2oth c. saw the end of fascism, so 2000 would see the end of Communism. I was whistling in the dark then, because the Communists had just taken over China. But now I really begin to feel that I’m living in a post-Marxist age. I think we’re moving into something like an age of anarachism: the kind of violence and unrest going on now in China, in the city riots (which are not really race riots: race hatred is an effect of them but not a cause of them) in America, in Nigeria, in Canadian separatism — none of this can be satisfactorily explained in Marxist terms. Something else is happening. . . There were always two sides to anarchism: one a pastoral quietism, communal (Anabaptist, Brook Farm) or individual (Chaplinism). Its perfect expression, in an individual form, is Walden, in a communal form, News from Nowhere. The beats & hippies with their be-ins and love-ins, the “Dharma bums,” are the faint beginnings of a new pastoralism. The hysterical panic about organization, full employment, keeping the machines running, & the like, is now waning as it becomes possible to do other things that work. The hippies only seem to be parasitic, but the fact of voluntary unemployment, of a cult of bums, is new. In the depression the statement “these people just don’t want to work” was the incantation of the frivolous, trying not to think seriously. But now there are such people, and the values they challenge are equally bourgeois and Marxist values. Frye: There are other things in the Canadian tradition that are worth thinking about. Thirty years ago [in the 1930s] the great radical movement was international Communism, which took no hold in Canada at all. There were no Marxist poets, there were no Marxist painters… The radical movement of our time is anarchist and that means that it’s local and separate and breaks down into small units. That’s our tradition and that’s our genius. Think of Toronto and Montreal (I know Toronto better than Montreal, but I think the same is true of both cities): after the Second World War, we took in displaced persons from Europe to something like one-quarter to one-fifth of the population. In Toronto in 1949, one out of every five people had been there less than a year. We have not had race riots, we have not had ethnic riots, we have not had the tremendous pressures and collisions that they’ve had in American cities. Because Canada is naturally anarchist, these people settle down into their own communities; they work with other communities and the whole pattern of life fits it. I do think we have to keep a very wide open and sympathetic eye towards radical movements in Canada, because they will be of the anarchist kind and they will be of a kind of energy that we could help liberate. Chiasson: How do you explain materially the fact that there is not a serious breakdown in the country if the base is anarchist? This entry was posted in Current Events, Frye on Anarchism, Politics, Society on November 3, 2011 by Michael Happy. News report on Marine sergeant and Iraq war veteran Shamar Thomas facing down NYPD officers for assaulting and arresting peaceful demonstrators. This entry was posted in Current Events, Frye on Anarchism, Pastoral Myth, Politics, Society on October 27, 2011 by Michael Happy. One of the most jaw-droppingly deft rhetorical reversals conservatives have ever accomplished has been to appropriate the term “class warfare,” which is being rolled out again as the Occupy Wall Street protests have finally made the people who matter nervous/annoyed. Whenever the privileges of the 1% of the population who possess 40% of the wealth are questioned, we begin to hear that the criticism constitutes class warfare. 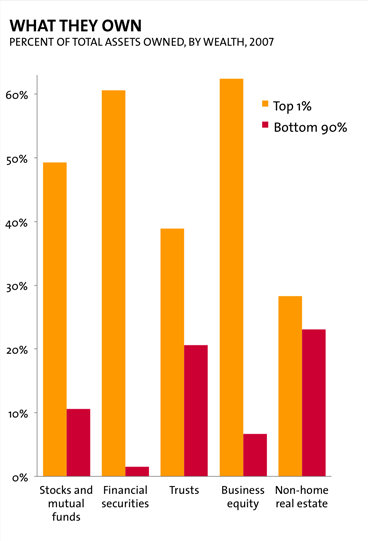 Class warfare no longer involves what the rich do to everyone else. It is now exclusively about the threat everyone else represents to the rich. Mitt Romney, who recently declared that “corporations are people too,” uses the term in the clip above. He also repeats another Republican talking point currently being endlessly repeated: “Half the people in this country don’t pay income taxes.” The reason they don’t pay federal income taxes is that they don’t make enough income. It certainly does not mean, as the point intends to suggest, that they pay no taxes. They pay lots of taxes, all of them regressive, like sales and payroll taxes. These are the only taxes conservatives seem to think are acceptable because regressive taxes literally cost them nothing. This entry was posted in Current Events, Politics on October 13, 2011 by Michael Happy. I picked up the buzz about this video of Elizabeth Warren on the campaign trail in Massachusetts a couple of days ago and thought I’d post it at the end of the week. Now I find that I’m an also-ran as it begins to pop up everywhere. Even Rush Limbaugh has lumbered onto the scene, pre-emptively declaring Warren a “parasite.” She scares the insurrectionist right already, with the election still fourteen months away. It’s no wonder why. If you haven’t already seen this video, you’ll be glad you did. This is what a “liberal narrative” sounds like (everybody’s citing what she says beginning at the 50 second mark). It’s so damn simple that it’s hard to imagine why liberal politicians haven’t been able to find it for the last three decades. If Obama had simply picked up the thread Warren follows here, he’d probably have a very different presidency today: one continuously refreshed by the hope he promised instead of deeply compromised and perpetually demoralized by the double-dealing of political nihilists. To know hope is to be able to speak a great truth with simple clarity. Previous posts on Warren here and here. This entry was posted in Current Events, Politics, Video of the Day on September 22, 2011 by Michael Happy. 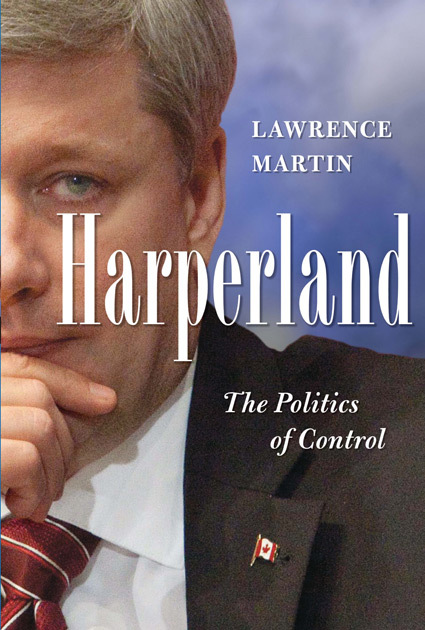 It was no small wonder that Canadians feared what Harper might do with a majority government. With that kind of power he could establish a hegemony the likes of which Canadians could not imagine. It’s no secret what’s coming: the construction of new prisons despite our steadily declining crime rate, a prospect that distresses even Conrad Black, as well as the introduction of a surveillance state with a “crime bill” that will allow the police to access our email and internet traffic without warrants. Sixty-one percent of Canadian voters cast their ballots to the left of the Harper Conservatives last May. That’s 61%. George Bush was at least required to have the appearance of more or less 50% of the vote in order to run amok on American ideals, laws, and constitutionally guaranteed freedoms. Harper doesn’t have anywhere near that kind of support, will never have anywhere near that kind of support, and, worse yet, knows he will never need it. Knowing that in fact appears to be his m.o. He apparently intends to make over this country to fit his own cramped, angry and unforgiving worldview on the basis of just the 39% who voted Conservative in the last election. With our first-past-the-post electoral system, the needs and expectations of the remaining very large majority don’t much matter, as Harper has made clear enough. His unrelentingly vicious disdain for his political opponents (see Stephane Dion and Michael Ignatieff) appears to extend to the people who vote for them. The most effective solution, unfortunately, is also the most elusive, which is to consolidate the massive majority on the left, as Harper did on the right when he helped to engineer the destruction of the Progressive Conservative party, and then lashed the wreckage to Alberta’s particular brand of resentment politics that evolved by way of the Reform Party, then the Canadian Alliance, and eventually Harper’s own custom-tailored Conservative Party. Until there is an effective political realignment on the majority left, however, there is still consolation, not least in the work that needs to be done to revitalize our politics and priorities. Whenever the Harper government burdens us with policies and laws that have nothing to do with us and everything to do with him and his remarkably small core-constituency, we should remind ourselves of our strength of numbers and resolve to use it by all the means democracy allows, beginning with free speech and the right to call to account the public servants who serve only at our will. Harper likes to end his speeches with “God bless Canada,” which is just one of a number of his unpleasant American imports into our much more civil political process. It may also represent a rare glimpse into his own harsh Day-of-Judgement Christian belief as a member of the Christian and Missionary Alliance. But Canada is not just a secular nation, it is the only multicultural nation in the world as a matter of statutory and constitutional law. So if a deity must be invoked, why must it be Stephen Harper’s? Why not “Allah bless Canada,” or “Yaweh bless Canada,” or “Jehovah bless Canada,” or “Krishna bless Canada,” or “All the gods of all the world’s polytheistic religions bless Canada”? And what about the large number of those who do not believe in gods of any sort, as it is their constitutional right to do? Does the prime minister not represent these people too? This is why God has no place in our shared public sphere, of which the prime minister is a most conspicuous representative. A Utopian society is inclusive. A dsytopian one is exclusive. It runs on fear and resentment. It builds prisons where none are needed, and it subjects its citizens to unwarranted surveillance as an ongoing exercise in intimidation. Freedom is not a boon to be granted by those who possess power. 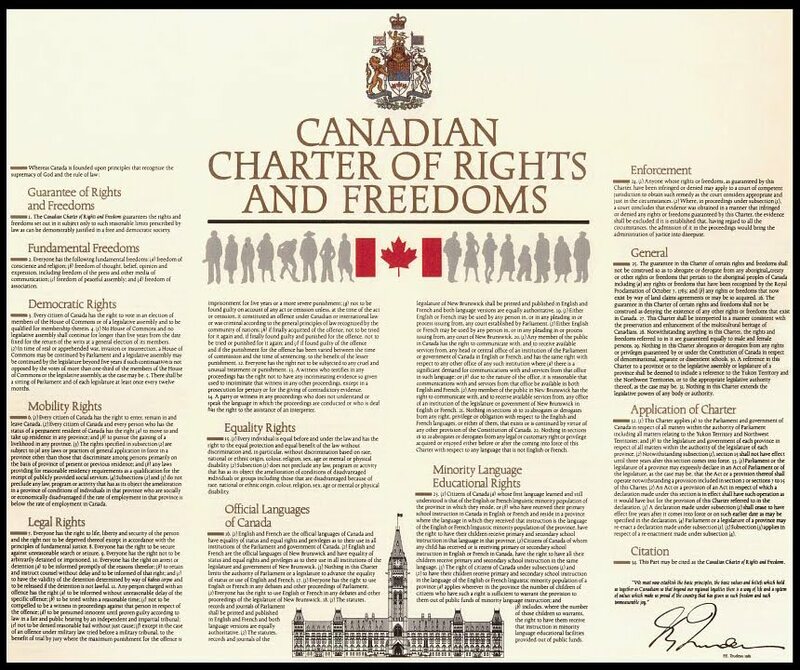 Our freedoms are expressed by the guaranteed rights of all citizens, whatever their status, whether they are homeless people living on the street, or a couple of Conservative senators and other party functionaries charged with the jailable offence of breaking federal election law: they are all equal before the law, and are not advantaged or disadvantaged depending upon who they know or who they don’t. We clearly do not need a suddenly-urgent policy of “law and order” included in our list of our national priorities. We already have law and order in this country to which Stephen Harper has done nothing to contribute. The most that is expected of him is that he not vandalize what he has been entrusted with. It doesn’t look like that’s going to happen. This entry was posted in Canada, Politics, Secular Society on September 19, 2011 by Michael Happy.